Moisture has a large impact on the mechanical properties of paper and fillers. Due to the strong hygroscopicity of the most of the fibres itself, a change in the ambient atmosphere instantly leads to changed properties, such as stiffness and dimensions. This also affects the creep proprieties of the paper. For a material under load mechano-sorptive creep occurring at repeated changes in climate can lead to rapture. This effect might be connected with the changes of elastic module during sorption. This work highlights a series of experimental method of water sorption characterization for determining vapour adsorption isotherms of paper and filler materials. Using a novel dynamic flow configuration, this gravimetric experimental system can measure both competitive multicomponent adsorption processes as well as water sorption and glass transition process. 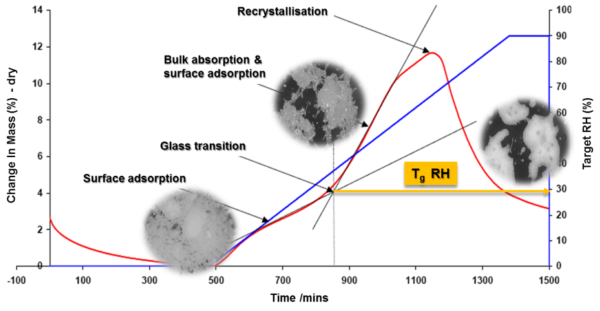 This characterization technique can not only be used across a wide range of materials at different temperatures, but is well suited for adsorption studies using organic vapours at high partial pressures. This work highlights a few examples of case studies such as the deuterium oxide (D2O) sorption in birch kraft pulps (95 % relative humidity), quantified by a dynamic vapour sorption (DVS) apparatus . Moreover we will focus on the characterization of the Tg RH (the critical relative humidity at the specific glass transition temperature) of a series of cellulosic materials. Inverse Gas Chromatography (iGC) is a commonly used technique to characterize solid surfaces. Different physicochemical properties of solid materials that can be determined with iGC including surface energy, Lewis acid and base constants and therefore the specific pair interaction parameter (Ka, Kb, Isp), solubility parameter (δT, δD, δP, δH), glass transition temperature (Tg), Work of Cohesion and Adhesion (Wcoh, Wadh) and so on. The importance of surface energies is well-known and proved by many scientific papers in the case of composites. The ultimate quality and performance of fiber/nano-filler composites depends strongly on the interfacial interaction of the components. In particular, the surface energy and surface area of natural nano fibers are directly related to the compatibility, dispersibility, and reinforcement quality. To enhance the adhesion properties at the interface, fibers are often exposed to various surface treatments. In this presentation, surface areas and energies of natural fibers from different origins and surface treatments have been investigated by Inverse Gas Chromatography (IGC). surface energy values of the individual components. In one of our most recent study in collaboration with Deakin University, the surface energy and the acid-base properties of ultrafine silk powders as new lightweight composite filler was measured by SEA system and the surface energy values were correlated with the cohesiveness and flow ability of the silk powders . In other recent studies on fibres, the BET surface area values of natural fibers were measured in triplicate to establish the reproducibility of the measurements resulting in standard deviations between 0.1 to 3.5%. Flax fibers had a higher surface area value compared to kenaf and cellulose, which was attributed to the fiber surface roughness . Flax fiber has also higher dispersive surface energy (γd) compared with kenaf and hemp. Additional, decreasing γd for fibers with higher lignin and hemicellulose content was observed . The surface energy values of nano-celluloses can be related to the crystallinity of the fiber due to nano-celluloses with high crystallinities has higher surface energy values . The inverse gas chromatography technique like SEA is a powerful technique to determine different physicochemical properties of different solid materials which are critical variables for manufacturing processes and product development. This presentation will summarize recent studies where IGC has been used to investigate surface modification of filler materials and its correlation to adhesion phenomena.